Hometown: Haddon Heights, New Jersey, U.S.
Died: June 3, 2005 in Operation Enduring Freedom. Unit: Army, 1st Battalion, 7th Special Forces Group, Fort Bragg, NC. Capt. 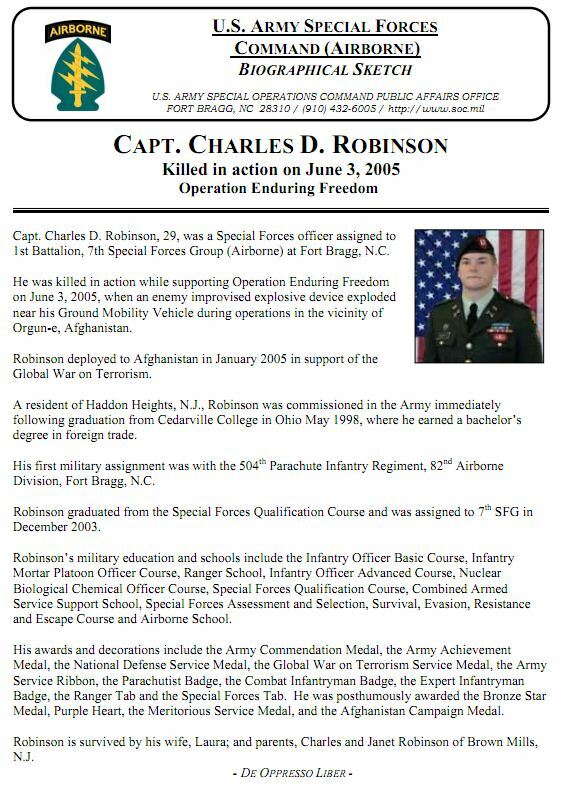 Charles D. Robinson Haddon Heights, New Jersey was commissioned in the Army immediately following graduation from Cedarville College in Ohio May 1998, where he earned a bachelor's degree in foreign trade. He graduated from the Special Forces Qualification Course and was assigned to 7th SFG in December 2003. Charles' life spanned the globe. The son of missionaries based in Haddon Heights, Robinson spent much of his life in Paraguay, where he developed a love of languages and a bond with other Americans stationed overseas. At Baptist Regional School in Haddon Heights, Robinson played soccer and kept in touch with friends after his family resumed their travels. And after the Special Forces sent him to Afghanistan in January as part of Operation Enduring Freedom, Robinson asked his family to mail him care packages of candy. He planned to give them to children in villages he was helping rebuild. During Robinson's childhood, his parents were missionaries based at Haddon Heights Baptist Church. He and his brother and sister were home-schooled by their mother in Paraguay. 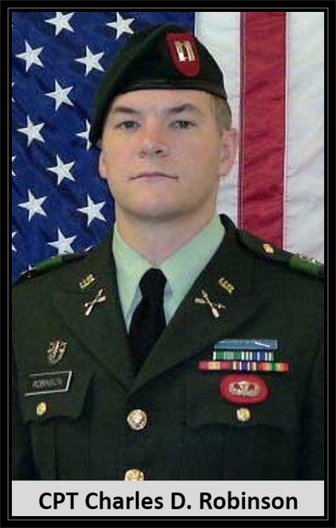 Robinson later graduated from Asuncion Christian Academy in Paraguay and while there he and his family developed a kinship with American military officials and other Americans living abroad. He later majored in international studies and global economics at Cedarville University in Ohio, graduating in 1998. That was where he met his wife, Laura, a native of Iowa. His awards and decorations include the Army Commendation Medal, the Army Achievement Medal, the National Defense Service Medal, the Global War on Terrorism Service Medal, the Army Service Ribbon, the Parachutist Badge, the Combat Infantryman Badge, the Expert Infantryman Badge, the Special Forces Tab and Ranger Tab. He was posthumously awarded the Bronze Star Medal, Purple Heart, the Meritorious Service Medal, and the Afghanistan Campaign Medal. He is survived by his wife, Laura, his parents Rev. Charles and Janet Robinson, a brother, Jeffrey and a sister, Christine. He was 29.